The holiday season is a time to celebrate with family and friends. Unfortunately, for many it also becomes a time for over-eating and weight gain. According to the National Institutes of Health, holiday eating can result in an extra pound or two every year. Over a lifetime, holiday weight gain can really add up. The holidays don’t have to mean weight gain. Focus on a healthy balance of food, activity, and fun. 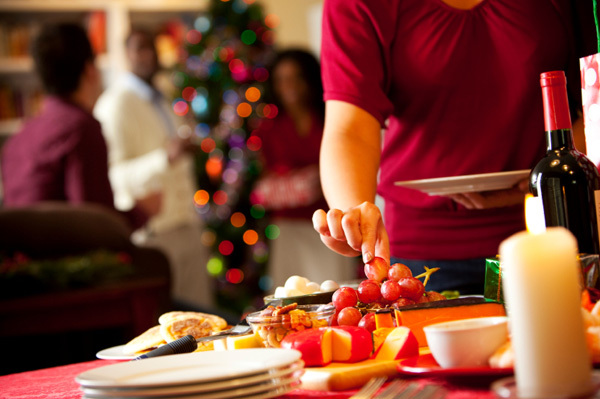 By implementing a few simple tips you can stay healthy through the holiday season. Plan time for exercise. Exercise helps relieve holiday stress and prevent weight gain. A moderate and daily increase in exercise can help partially offset increased holiday eating. Try 10- or 15-minute brisk walks twice a day. Don’t skip meals. Before leaving for a party, eat a light snack like raw vegetables or a piece of fruit to curb your appetite. You will be less tempted to over-indulge. Be careful with beverages. Alcohol can lessen inhibitions and induce overeating; non-alcoholic beverages can be full of calories and sugar. If you overeat at one meal go light on the next. It takes 500 calories per day (or 3,500 calories per week) above your normal/maintenance consumption to gain one pound. It is impossible to gain weight from one piece of pie! Take the focus off food. Turn candy and cookie making time into non-edible projects like making wreaths, dough art decorations or a gingerbread house. Plan group activities with family and friends that aren’t all about food. Try serving a holiday meal to the community, playing games or going on a walking tour of decorated homes. Green Bean Casserole — Cook fresh green beans with chucks of potatoes instead of cream soup. Top with almonds instead of fried onion rings. Mashed Potato — Use skim milk, chicken broth, garlic or garlic powder, and Parmesan cheese instead of whole milk and butter.